Nevertheless, the 50 Democratic senators felt compelled to respond. Doesn't the U.S. Senate have more important matters to attend to than David Broder? 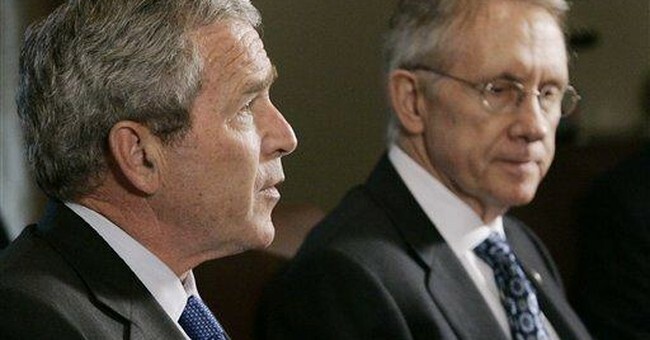 It is perhaps admirable, and certainly reassuring to Reid, that his fellow senators came to his defense. But this kind of overreaction to a columnist is rare, if not unprecedented, and betrays a disturbing hostility to legitimate criticism. Though Broder is a great political writer, he is not the president of the United States. He doesn't command an army or meet routinely with heads of state to negotiate planetary alignment or even global heating and cooling. He's a commentator. And what, exactly, is a commentator supposed to do if not comment? When he or she makes a point -- from the perspective of an observer with more than 50 years' experience in Broder's case -- does disagreement necessitate a movement? Outrage has become such a predictable response to any difference of opinion that it's lost its heat. When everything is outrageous, nothing is. In fact, what Broder said was not remotely outrageous. It's hardly crazy to think it inappropriate when the leader of the most powerful governing body in the world declares in the midst of a war that the war is lost. Broder's point, provocative but hardly incendiary, was that American lives are on the line and that Reid's remark didn't help matters. Rather than provide encouragement to our enemies, Broder suggested that the Senate leader might do better to heed the recommendations of the Iraq Study Group report and seek common ground toward both military and political solutions. Broder needs no one to defend him. His record, which includes at least equal numbers of columns criticizing Republicans as Democrats, speaks for itself. But the Reid-Broder dust-up reveals the degraded state of public debate today. People don't disagree; they brawl. Punditry has become a free-for-all -- and mutual respect is locked in the attic with Aunt Sadie. Part of this devolution in discourse has been brought about, no doubt, by the volcanic explosion of the blogosphere, which has democratized free speech in a way that is not always positive or pretty. Everybody can type, but not everyone can write. Everyone has an opinion, but not everyone comes equipped with the same skills and experience. The disinhibiting effect of anonymity, meanwhile, has unleashed something dark in the human spirit that seems to have infected the broader culture. It isn't enough to say that Broder is all wet; instead he's ``foaming at the mouth,'' a ``gasbag" and a ``venomous'' bloviator,'' borrowing again from Begala. Begala, who came to punditry via the Clinton White House, isn't anonymous, of course. But many other lesser-knowns have taken Broder to task in what has become the typical blog-inspired pile-on. One wonders where these same thin-skins were when Broder was leveling his sights at the Bush administration. Was Broder a gasbag when previously he lambasted the Bush budget deficit, the tax cuts for the rich and the mess in Iraq? A fair treatment of Broder's recent column would consider the broader context of his body of work, but fairness is missing from this debate. Also is respect for those, like the Pulitzer Prize-winning Broder, who have toiled long in the fields to earn the kind of forum others merely feel entitled to. The absence of fairness and respectful dissension -- and the decline of civility wrought by our nation's unhinged narcissism -- now there's something worthy of outrage.